Most people might think that introducing Krav Maga to the Chinese would be like carrying coals to Newcastle. After all, China is famous for the diversity of its martial arts styles, and household names such as Bruce Lee and Jackie Chan have greatly contributed to the worldwide promotion of the kungfu phenomenon. How could an Israeli self-defense and fighting system created only a few decades ago appeal to the Chinese? In the fast-paced, modern society, where efficiency and flexibility are paramount, Krav Maga ticks all the boxes: simple, straightforward defensive and striking techniques adapted to various situations; a no-frills and practical fighting method based on economy of movement and simplicity of execution; and a confidence-boosting, awareness-raising combat system. Krav Maga is the brainchild of Imi Sde-Or (formerly Imrich Lichtenfeld). Born in 1910 into a Hungarian Jewish family, he grew up in Bratislava, Slovakia, where he excelled in boxing, wrestling and gymnastics. He fought against anti-Semitic organizations in the 1930s and became the unofficial leader of a group of young men who defended Jewish neighborhoods against racist and fascist thugs. His first-hand, real-world experience of hand-to-hand combat enabled him to develop his own methods for self-defense and street fighting—built on natural movements and reactions, combined with an immediate and decisive counterattack—to create effective combat techniques. Most elite law-enforcement and special forces units around the world have adopted Krav Maga as their preferred system of defensive tactics. One of his students, Grandmaster Eyal Yanilov, has propelled Krav Maga to international fame at the start of the 21st century. The sprightly 58-year-old established Krav Maga Global (KMG) in 2010, an organization that provides a systematic and unified curriculum in a structured format whilst maintaining the highest level of training. Under the personal supervision of Yanilov, KMG has branches in more than 60 countries and has nurtured over 1,000 instructors worldwide. Yanilov recently embarked on a two-week Asian tour to promote Krav Maga and teach seminars in South Korea, Japan and China. On April 19, in an interview with Beijing Review during his five-day stopover in Beijing, he noticed how fast Krav Maga has developed. "Last time I was here, I was really impressed," he said. "Things are moving fast here in China." Such success is the result of the dedication of a tightly-knit team of Krav Maga instructors and wouldn't have been possible without the efforts of Von Ng, a 40-year-old Canadian of Chinese stock, and his wife Yonina Chan. Ng is country director and head instructor at KMG China. He has been practicing different martial arts around the world since the age of 14 and started Krav Maga in the Philippines in 2004. 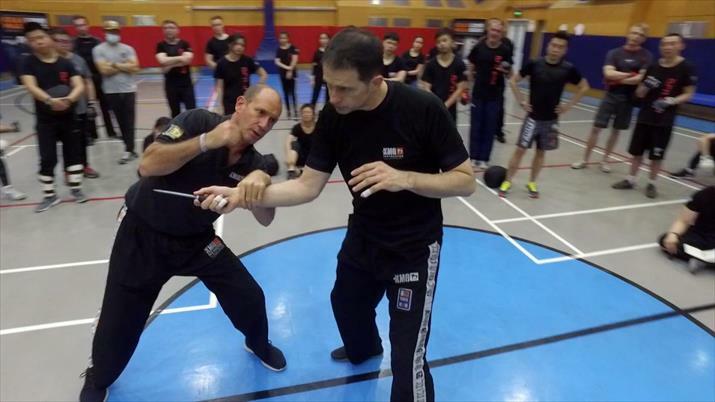 He became an instructor in Beijing in 2010 and is working full-time to develop Krav Maga in China. "In the beginning, we had some people, mostly men, with some martial arts experience, but now the situation has changed. We have a lot of women," said Ng. However, this is a niche market, and competition in the martial arts segment is fierce. "Beijing offers a lot of activities, like Muay Thai [Thai boxing], mixed martial arts, Brazilian jiu-jitsu, Kendo, so it's tough." KMG China now boasts over 350 members, 80 percent of them Chinese. KMG has an 18-level ranking system—five practitioner levels, five graduate levels, five expert levels, and three master levels—each with a specific curriculum and requirements including fitness and conditioning. Would-be instructors undergo strict assessment to guarantee both the quality and the integrity of Krav Maga. "In the beginning, people come to Krav Maga because they're interested in martial arts. That's how we always start. We always want to spread the name and recruit people who can be instructors," explained Yanilov. KMG China now boasts seven Chinese members at graduate level. "There is a core team that has been growing, and they're very dedicated. The idea is to nurture the next batch of instructors," said Ng. "We've set up the foundations and planted the seeds for Shanghai and Shenzhen. These are the next targets." Krav Maga is grounded in reality, and the curriculum forms a holistic, integrated system that reflects real-life situations. "We'll teach you to defend yourself in a car, whether the attack is from the inside or the outside, to fight in corners, [with your] back to a wall, seated, on the ground, with attackers from all directions, and in all types of situations," said Yanilov. "The name of the game is train, and then you become good." He Ning is a 30-year-old interpreter from Beijing. She has been practicing Krav Maga for only three months. "I regularly go on business trips, and I'm alone most of the time. Krav Maga makes me feel safer, and it's also a great workout," she said. "However, it's more about changing your mindset than just getting stronger." If China's rapid urbanization and evolving lifestyles have changed the social fabric of the country, such transformation has also brought about a raft of problems, from antisocial behavior (often related to alcohol and substance abuse) to sheer violence (mostly muggings and random attacks). Moreover, tempers easily get frayed—as epitomized by road rage—and women are often the victims of predators. "I've been sexually harassed and groped in the subway and on the bus. That's why I need techniques to protect myself," explained He. "You don't necessarily want to get involved in a fight, but it's better if you know the techniques, [so you know] how to get out of dangerous situations." Ray Ally, a branding consultant from London, has been doing Krav Maga for a year. "I started mainly because I wanted to get fit and do something practical that I could use if I needed to," he said. "The workout is probably the hardest workout I've ever done." Learning a traditional martial art was not an option. "I'm 50 years old already, and I don't want to spend 20 years learning Chinese kungfu. I read a lot online about Krav Maga and got interested in the philosophy of it," he remarked. Like most practitioners, Ally believes that Krav Maga is beneficial to developing mental abilities to make decisions almost instinctively in stressful, fast-moving situations. "I would recommend Krav Maga to my kids. I think that when they're old enough, it's something that will give them confidence," he reckoned. "You feel more confident because you know how to handle yourself in a situation. I hope to never be in that situation, but if I ever was, I think I would know what to do." As the saying goes, "Better safe than sorry." Krav Maga provides a full set of techniques to avoid, prevent, deter or deal with all types of violent and potentially dangerous situations. "I've been in China for nine years, and I've had confrontations, but nothing leading to a fight. I think China is quite a safe place compared to other places in the world," Ally said. At the end of his three-hour master class in Beijing on April 21, attended by over 80 participants from all walks of life, Yanilov sounded optimistic as he boosted the troops' morale. "Regular training with your instructors is most important. Constantly progress; mentally, technically, tactically, with better fitness [and] a better mindset."